(a) 16.2 nm × 16.2 nm STM image of the modulated honeycomb √7 × √7 superstructure with a close-up in the bottom left corner (sample bias: −1.12 V, 1.58 nA; the √7 × √7 unit cell is drawn in black); (b) associated LEED pattern taken at 59 V; (c) schematic illustration of one sixth of the pattern, filled dots: hidden (0,0) spot and integer order spots, open circles: spots corresponding to the √7 × √7 superstructure (in red), the √19 × √19 one (in green) and the 5 × 5 (in blue). A newly published study details how a team of researchers successfully synthesized the 2D material germanene for the first time. The material has been presented today in the Institute of Physics and German Physical Society’s New Journal of Physics. Much like silicene, the proposed method for synthesizing germanene is to deposit individual germanium atoms onto a substrate under high temperatures and in an ultra-high vacuum. 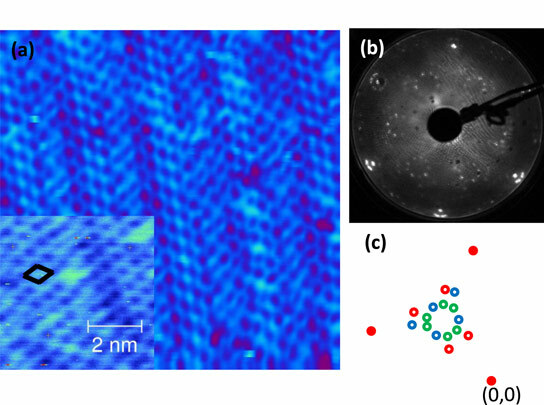 The material was also observed under a scanning tunneling microscope, which revealed the characteristic honeycomb structure of a 2D material. 1 Comment on "Researchers Successfully Synthesize 2D Material Germanene"